EGLink reads incoming chat messages and parses for URLs from various private channels, with the option to listen in to public channels. 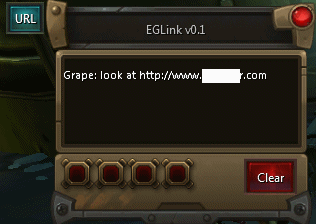 Click the button or use the slash command /eglink to bring up the URL list. Click the URL you wish to copy and it will be copied to your clipboard. Should now remember where button was after reloads. Now prunes messages to just the link. When a URL is seen by the EGLink, the button will turn from blue to red.